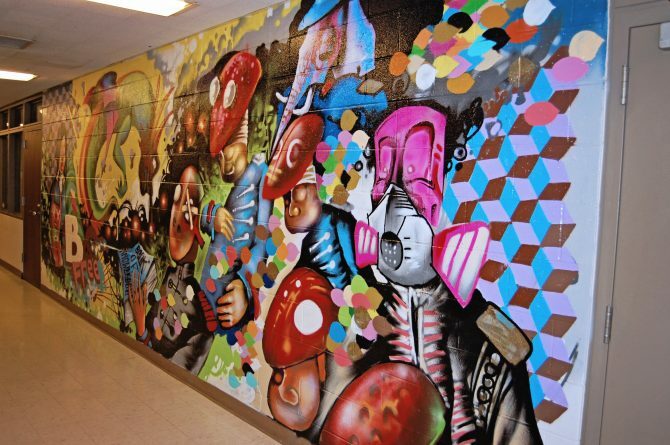 Kent Bellows Studio & Center for Visual Arts’ (Re)Create Urban Arts Program allows young artists to work with experienced mentors to recreate the idea of graffiti and street art-inspired artwork. During a 16 week period, young artists find their voice with spray paint and work with local organizations to create collaborative community murals. Two murals have been painted on the lower level walls of W. Clarke Swanson Branch. Each mural represents a theme designed by students with their mentors. After interviewing library patrons and staff to get a sense of what the Library meant to the community, the students did individual sketches and chose one idea for the theme. The first mural illustrates that through knowledge (gained from the library) people have options about the direction of their future. The dragon in the mural symbolizes obstacles faced; and that one can be a captive, a victim or be free. For the second mural, students chose a tree to represent the learning and growth one can get in the library, and the owl represents knowledge. All the leaves were painted from stencils that the students designed based on leaves they collected.